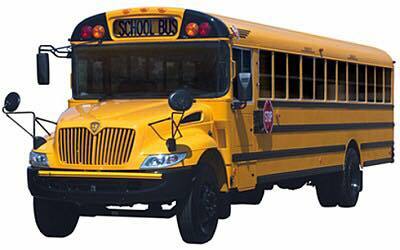 Dinah Trotty Blackshire has reserved bus transportation Friday night from the Fredonia Hotel to the football game. Bus will leave the hotel approximately 5:45. It will bring you back to the hotel at halftime. Cost is FREE!! We will reserve a table both Friday night and Saturday night for a memorabilia display if anyone would like to bring anything to share. Bring anything full of memories of 'Dear Doches High'!! Hello, Classmates!!! Beth Bussey Thomas has reserved the large patio at Fuzzy's Tacos (4909 North St #215, Nacogdoches, TX 75965) for Saturday morning. Those who would like can show up for tacos/breakfast/lunch between 10:00AM and 1:00PM. Please let me know if you're planning on coming so we can have a head count! There will be t-shirts available to wear to Friday's football game. They are short-sleeved black shirts with this awesome logo that Dinah Blackshire helped design! 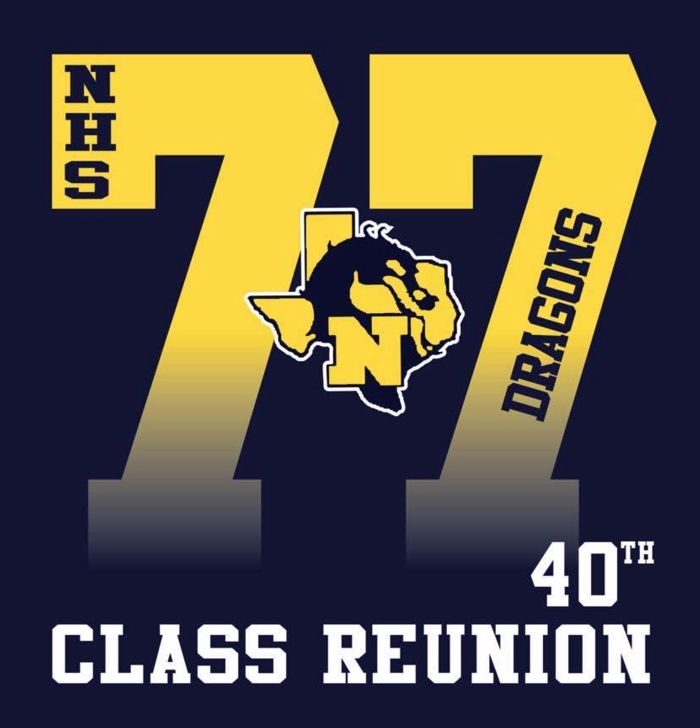 Please let me know by posting here with your size (men's S, M, L, XL, XXL, XXXL) or texting me 281-650-5913 or emailing me gingermanuel@gmail.com. Deadline to order is October 5. You can pay for them ($15) when you pick them up Friday night! PLEASE NOTE THAT WE NEED YOUR RESERVATIONS BY OCTOBER 5TH!!!! 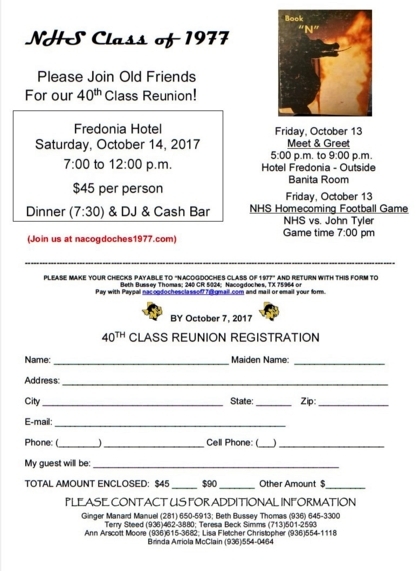 If you would like to pay for your Saturday night dinner at the Fredonia, please click the Donate button below. Donations can be made by PayPal, or with a regular credit card if you do not have a PayPal account. Please note that there is a small fee to pay by PayPal since they only let us set up as a business account. If paying by PayPal, please include that amount. (If you are paying $45 for one person, you'll pay an extra $1.60. If you're paying $90 for two people, you'll only pay an extra $2.90.) Or you could just mail a check to Beth Bussey Thomas (without the extra fee).